With Citizens' Help, Cities Can Build A Better Bike Lane — And More In Burlington, Vt., the city's Department of Public Works is giving citizens the permission and the tools to remake their own streets. But not everyone thinks that's a good idea. 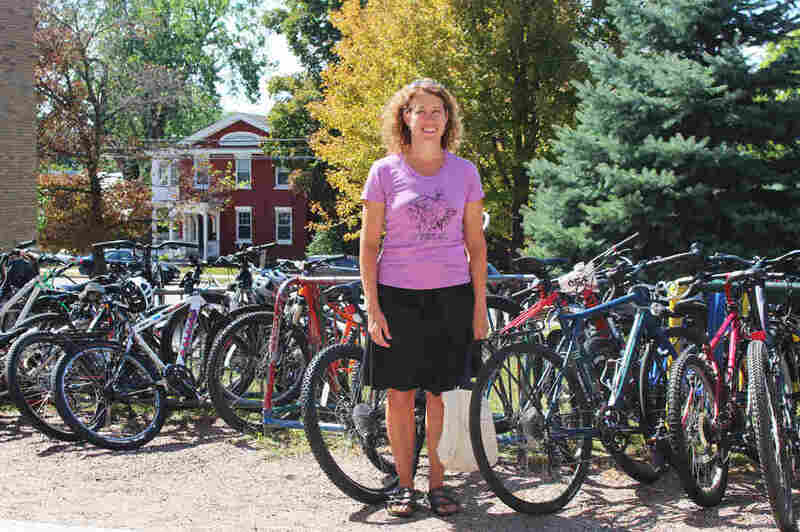 Peggy O'Neill stands outside Edmunds Elementary and Middle Schools in Burlington, Vt. She was one of the strongest advocates for the bike lane in her city but met a lot of resistance. At first glance, the battle for a bike lane in Burlington, Vt., seems like the sort of thing that plays out in town meetings everywhere. A group of concerned citizens wanted a protected bike lane by the elementary school downtown, to make it safer for kids to get to school. But there are a few things that make this case different. For starters, the bike lane was really a symbol of something bigger: showing that streets could be made better for everyone, and that citizens could lead the way through experimentation. This is Church Street, a pedestrian-only thoroughfare in downtown Burlington. Peggy O'Neill was one of the strongest advocates for the bike lane. She and her family had just come back from a semester in Bogota, Colombia, the city that invented Ciclovia — closing streets to cars, and opening them to everything else. "It's the entire city," she explains. "Avenues, huge avenues! Open to bicycles. Dogs. Skateboard riders. Rollerbladers. Everything! Not cars. So you have this privilege and priority in the streets." She was fired up to bring some of Bogota's ideas to Burlington. Along with many others, O'Neill tried to get the city to approve the protected bike lane for a week, a day, or just an hour. "Every meeting I would go in feeling optimistic," she says. "How can they say no to kids?" "It was incredibly discouraging," O'Neill says. "We really wanted to say yes to it," says Miro Weinberger, Burlington's mayor. He says he wants Burlington to be the sort of place where citizens' energy can flourish — noting that city governments can be the instigators of tactical interventions, too. He points to New York City, and the success that city had in remaking Times Square from a traffic-choked bottleneck into an incredibly popular pedestrian plaza. And New York started by just trying it out, one Memorial Day weekend, with some orange plastic barrels to reroute cars and lawn chairs to sit on. (Left) Mayor Miro Weinberger wants Burlington to be best biking city on the East Coast. (Right) Jason Van Driesche stands in Local Motion's trailer full of tactical urbanism supplies. Van Driesche believes DIY methods can spur permanent change. Part of Mayor Weinberger's vision is to make Burlington the best biking city on the East Coast. "But we've got a long way to go to get there," he says, "and we think it will be accelerated if citizens are empowered to help us do some of the work that's going to be necessary." So the city created a tactical urbanism policy, making it easier to greenlight projects like O'Neill's. And it published a 50-page tactical urbanism guide, offering ideas for projects citizens might propose, from curb extensions that shorten pedestrian crossings, to wayfinding signs that make it easier to explore the city. Brendan Hogan is another bike lane advocate. 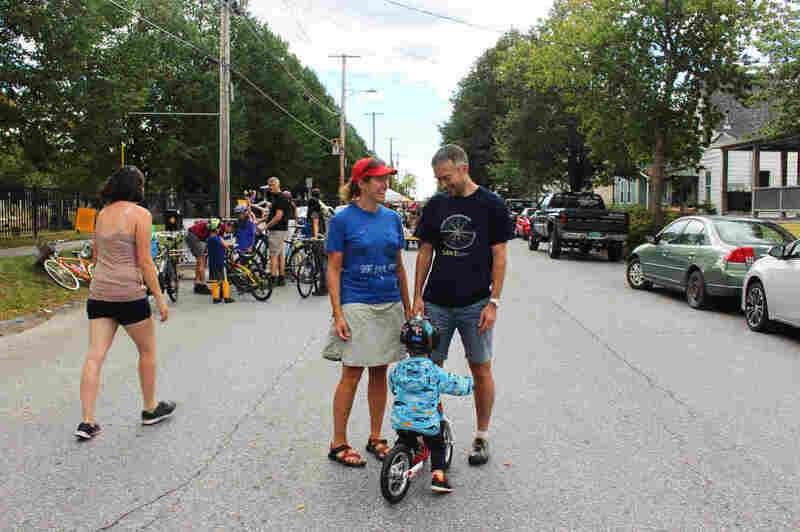 At Open Streets, Burlington's now-annual, much smaller version of Ciclovia, people of all ages biked past, on a mile and a half of streets closed to cars. O'Neill and her family were there, making pedal-powered smoothies on the back of a bike. O'Neill and fellow bike lane advocate Brendan Hogan stand with Hogan's son George on a blocked off street during Open Streets in Burlington. Hogan said the city's new efforts felt like a victory, even though he didn't get everything he wanted. "The city was not ready for a bunch of citizens proposing changes to their streets, us laypeople without civil engineering degrees," he said. But Hogan says their efforts laid the groundwork – for both the city and the citizens – to do this kind of thing in the future. And for advocates like Jason Van Driesche, deputy director of the Vermont walking and biking nonprofit Local Motion, the unsanctioned methods still have an appeal. "I'd be lying if I didn't say that at times I have been sorely tempted to go out with a can of spray paint and paint a damn white line on the street. But my better self remembers that if I want something permanent, I need to be strategic." 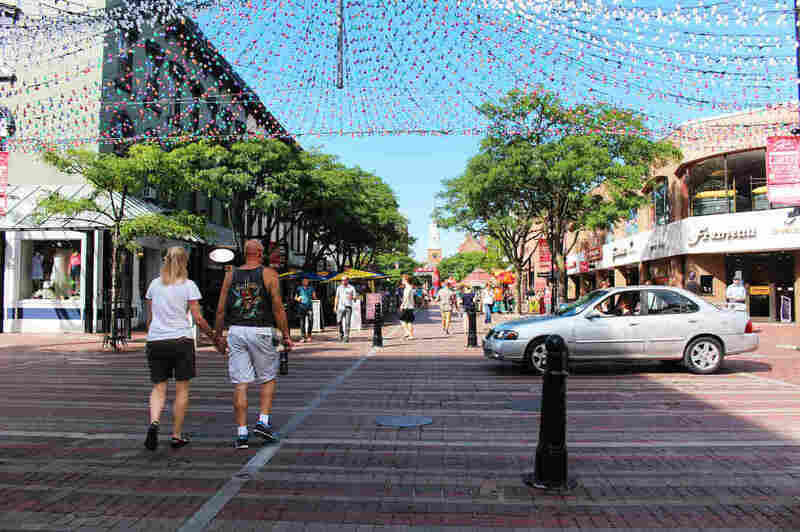 As Burlington and other cities adopt the scrappy tactics of their citizens, they'll need to show that they can make good on tactical urbanism's original principles — to move faster, try new things, and not be afraid to fail.